T La’el Collins vs. 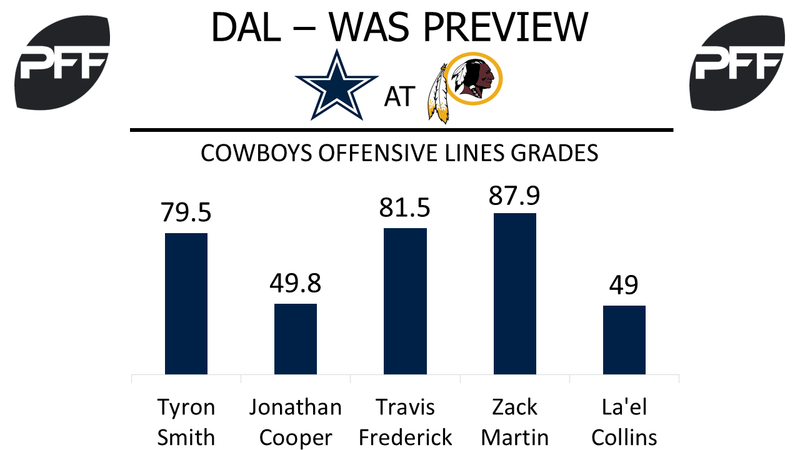 Edge Ryan Kerrigan – La’el Collins hasn’t had the easiest transition to right tackle this season, currently grading as the 52nd offensive tackle in the league with an overall grade of 49.0. Collins did have a solid performance last week in pass protection against the San Francisco 49ers, where he only allowed one pressure the entire game. His pass-block efficiency (measures pressure allowed on a per-snap basis with weighting toward sacks allowed) of 97.3 ranked 15th among 62 qualifying offensive tackles in Week 7. Unfortunately, Collins draws a tough matchup this week, as he is projected to see plenty of the 24th rated edge defender Ryan Kerrigan. Kerrigan’s pass-rushing productivity (measures pressure created on a per snap basis with weighting toward sacks) of 11.1 ranks 27th among 109 qualifying edge defenders. This could be the matchup to watch while the Cowboys are on offense. WR Dez Bryant vs. CB Quinton Dunbar – Dez Bryant continued his up and down season against the 49ers, as he had an impressive touchdown catch, but also recorded another drop. Bryant has now dropped four of his 32 catchable targets on the season, giving him a drop rate of 12.5, tied for the 18th highest among 68 qualifying wide receivers. Only five wide receivers have more drops than Bryant. Quinton Dunbar has had a solid season, currently ranking 20th out of 112 qualifying cornerbacks. As the ninth-most targeted wide receiver in the league, don’t expect the matchup to deter Prescott from finding Bryant. QB Dak Prescott vs. the entire defense – Dak Prescott is having anything but a sophomore slump, currently ranking 12th among 34 qualifying quarterbacks with an overall grade of 80.6. His run grade of 88.2 ranks first among all quarterbacks. His adjusted completion percentage of 75.7 ranks ninth among 32 qualifying quarterbacks. Not only does Prescott not have an interception on a deep pass (targets 20 yards or more downfield), he only trails Alex Smith on adjusted completion percentage on deep passes. He’ll throw any where on the field and will take off on the run, so every defender will have to be on their toes against the Cowboys this week. T Morgan Moses vs. 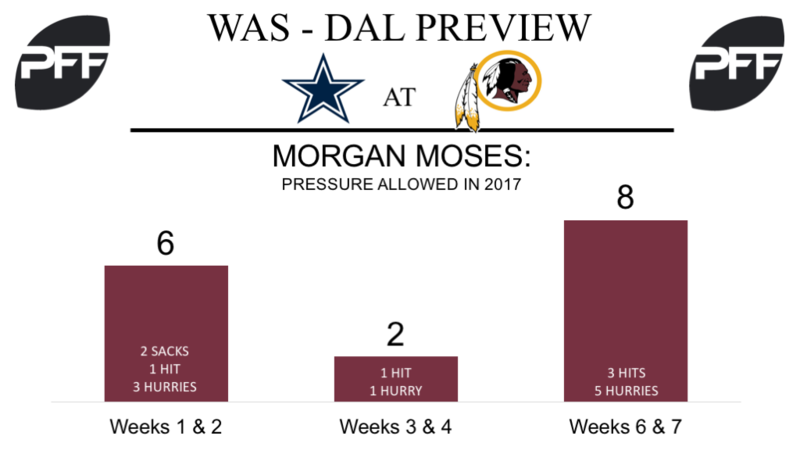 Edge Demarcus Lawrence – Morgan Moses has had an up and down season in pass protection so far this year. It started off poorly, after he allowed two sacks, a hit and three hurries in his first two games. He cleaned up his act for Weeks 3 and 4, and allowed just two total pressures during those games. However, Moses is now coming off another poor two game stretch where he’s allowed three hits and five hurries on 84 pass-blocking snaps. All told, Moses currently ranks 31st of 59 offensive tackles with a pass-blocking efficiency of 94.3, and to make matters worse, he’s currently dealing with two separate ankles injuries and will have to face off against Demarcus Lawrence, who has produced pressure on 18.1 percent of his pass-rush snaps (sixth best among edge-defenders) this year. He currently ranks seventh among the same group with a pass-rush grade of 89.0. RB Rob Kelley vs. LB Sean Lee – The team’s starting running back has been plagued with injury so far this season, and has only managed 88 offensive snaps through six weeks. All told, he’s logged 36 attempts, forced six missed tackles and averages 4.1 yards per carry, which ranks 26th of 57 backs with at least 35 attempts, however, he’s yet to find the end zone on any of his carries. Another week removed from his rib injury, he’ll be looking put his slow start behind him, but it won’t be easy against linebacker Sean Lee. Lee has already tallied 13 run stops this season, and ranks second among 4-3 outside linebackers with a run-stop percentage of 15.3 percent. WR Josh Doctson vs. CB Orlando Scandrick – Last week against the Eagles, the second-year receiver played more than 80 percent of Washington’s offensive snaps for the first time of his young career, signalling that the coaching staff have finally decided to expand his role in the offense. It’s been a long time coming, and his role will likely replace that of free-agent signing Terrelle Pryor, so he’ll want to take the opportunity with both hands. Through six games, Doctson has hauled in all seven of his catchable targets for 129 yards and two touchdowns, with 72 of those yards and one touchdown coming via the deep ball. He’ll be looking to take advantage of Orlando Scandrick in coverage, who has been targeted five times on ‘deep’ routes this season, and has allowed four receptions for 96 yards and a passer rating of 118.8.